As fewer people learn and use analog clocks on a daily basis, the more urgent the need for a digital wall clock becomes. While traditionally, reading an analog clock was an essential part of school life, it’s now becoming less relevant as the digital age takes over. Of course, it’s still a fundamental part of the curriculum, but many children are not able to keep up with their new-found skills with the lack of an analog clock in many homes. In essence, it’s no longer a relevant skill to have. If you’ve welcomed technology into your home with open arms, then you may benefit from the addition of a digital wall clock. Not only does it provide an accurate representation of time without having to count around the hands, but many of them also tell the time in 24-hour time, provide the temperature, and even the date, month, and year, as well. A digital wall clock is now one of the most convenient pieces of wall art to have in your home, so why not take a look at these options below? Some are beneficial for travel, while others are helpful when you need to know not only the time, but the date, month, year, and temperature as well. Each of these clocks has something to offer, so you’re sure to find one that ticks all the boxes for your requirements. Owning a digital wall clock can add so much convenience to your life, especially if it doesn’t require you to set the time. This wall clock from Marathon will bring a new element of ease to everyday life. Rather than worrying about it being at the right time, or setting it once the batteries are flat, you can rest assured the time on it will always be correct. 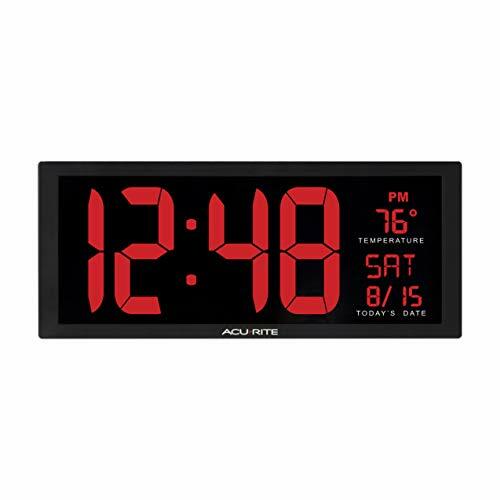 Rather than rely on your time-setting skills, this digital wall clock uses radio frequencies to set the correct time. As a result, it’s configured to receive the accurate time from the Colorado Atomic Clock. It displays the time in either 12-hour or 24-hour mode, and you can’t turn it off manually either. However, there’s more to this digital wall clock than just accurate timing – although this will provide no end of convenience to the user. It’s also a sleek, slim clock with large digits, an alarm that you can snooze in five-minute intervals, and it offers many different time zones as well. Set it to Eastern, Pacific, Mountain or Central time, and even alter the daylight-saving times if you wish. 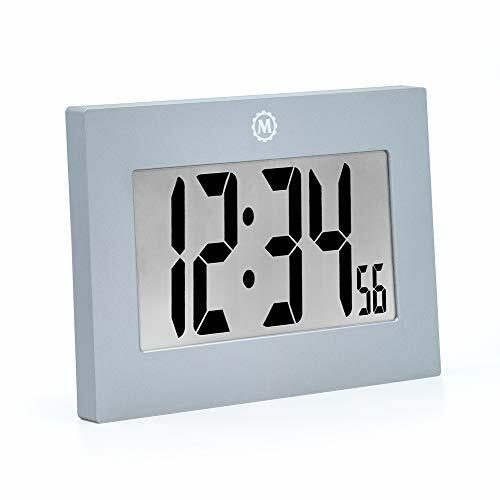 Designed to suit all manner of home décor while being affordably priced at the same time, there’s every reason to consider purchasing this digital wall clock from Marathon. If you’re looking for a clock that can act as both a digital wall clock or one for your desk, this versatile option could be a winner. Produced by HeQiao, it’s a stylish, sleek and innovative clock that will suit many different users. Operated by two AAA batteries, it’s suitable to sit free stand either on your desk for a quick glance when you need it or adhered to your walls as well. It has an easy-to-read high-resolution display, it’s easy to mount to your walls, and it ties in well with most modern décor as well. However, this digital wall clock is packed full of other convenient features as well. It shows the time, day, month, and year, and even lets you know what the temperature is. All of these features come in useful if you don’t have time to search for other digital devices for the answers. What’s more, it’s easy to read on the vibrant display. If you travel a lot, this clock can also become your travel companion. Set it up beside your bed, set the digital alarm, and let it become your alarm clock for an early rise. You can even snooze it if you want to get a few extra minutes. 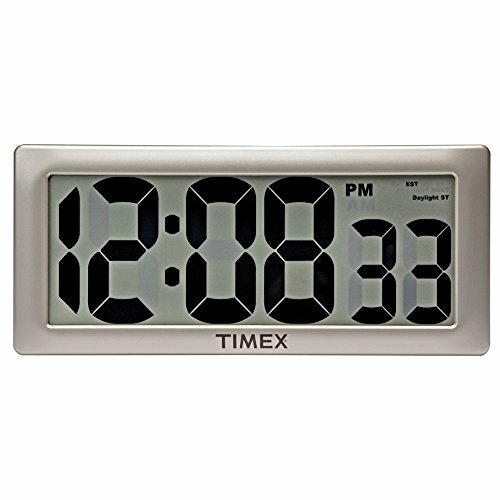 Perfect as a gift or for yourself at home or the office, this digital wall clock will become a firm favorite in no time. If your analog clock is looking a little worse for wear, it might be time to upgrade to a sleek, stylish and compact digital wall clock like this one from Marathon. While an analog clock can only tell you the time, this digital clock goes above and beyond with all manner of convenient features. With an affordable price tag as well, you’re sure to want to add it to your shopping cart today. It’s easy to read – which is perfect for those who are short-sighted, and it also has a light sensor to brighten the screen as it gets darker. You can also benefit from seven different languages to ensure it’s going to suit your needs well. What’s more, it offers six different time zones to suit your location. Select either Pacific, Mountain, Central, Atlantic, Eastern, or Newfoundland. The options are truly endless for how convenient this digital wall clock can be. 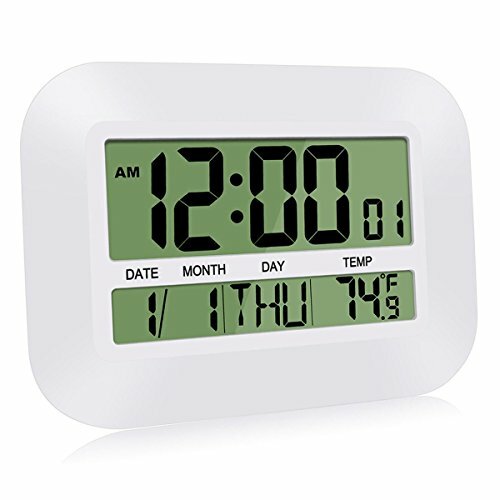 Aside from telling the time, this clock also provides the indoor temperature and the indoor humidity levels as well. You can select from either Fahrenheit or Celsius, and even set the day, month, and date as well. Never again will you have to rely on a calendar to tell you what time of the year it is. This is a wall clock that’s well worth your consideration. If you want a clock that can do more than only tell the time, it might be time to invest in this digital wall clock from HeQiao. Designed to tie in well with most contemporary décor – be it at home or the office, it’s an attractive clock that is well worth your consideration. It comes with a 12-month warranty for your peace of mind and even functions as either a clock for your desk or for on the wall. It can sit free stand on a counter when fitted with two AAA batteries, and then looks sleek and stylish when adhered to your wall as well. Unlike most analog clocks that are noisy and don’t give you anything other than time, this clock is quiet and packed full of features. It won’t tick and also features a large, easy-to-see display that’s both high resolution and vibrant during the day and night. You can set the time to read in 24-hour or 12-hour time, take note of the interior temperature in degrees-Fahrenheit or Celsius, and even set the alarm for the morning as well. As an alarm clock, it also has a snooze function so you can get a few more minutes of shut-eye. 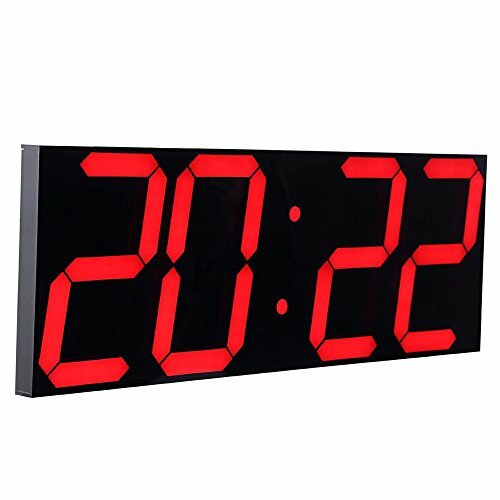 This entirely functional digital wall clock will make a great addition to any area in your home or place of business. If you love technology and all its advancements, you are sure to enjoy this digital wall clock from hito. 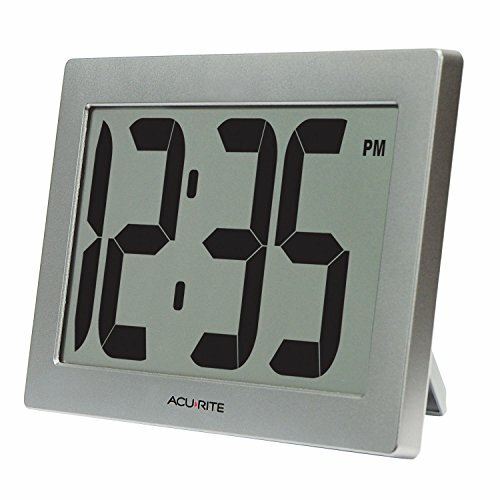 As an extra-large clock, it trumps many other digital clocks on the market in both size and functionality. It’s suitable for use at the office or anywhere at home and is easy to adhere to the walls with a pin, nail, screw, or hook. It also only features three controls and is exceptionally easy to set up. Aside from displaying the time in both 24-hour or 12-hour format, you also benefit from a range of other information. You can see the date, month, and year, as well as the indoor temperature. What’s more, if it’s too bright or dull, you can adjust the brightness as well. This digital clock is also leagues ahead of its competition for running on AC power as opposed to batteries. Save money on endless battery purchases and instead benefit from a clock that will run 24/7. If you have a power failure, you will also be pleased to know the clock’s internal memory will prevent it from losing your time, date, month, and year. Everything has been thought of with this digital wall clock from hito. Striking a healthy balance between technological advancements and elegance can be tough, but it’s not impossible thanks to this digital wall clock. Produced by La Crosse Technology, it’s an eclectic mix of old-school charm and new technology for your convenience. It’s available in a beautiful color scheme, uses an atomic clock with radio signals to set the time for you, and is packed full of other convenient features as well. 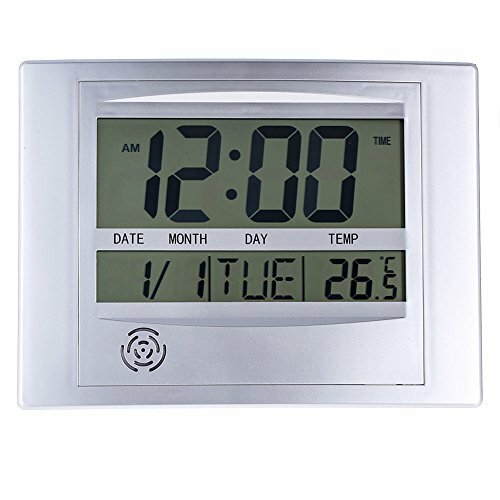 Aside from its beneficial time setting functionality, it also lets you know what the indoor and outdoor temperature is, what the moon’s phase is, and shows the time in a 24-hour or 12-hour format as well. There’s everything to love about this digital wall clock. What’s more, it’s entirely functional as an alarm clock as well, while covering 13 different time zones. If you travel, this is a much-loved accessory to pack in your suitcase. If you’re after a stunning digital wall clock that’s both affordable and functional, don’t look past this one from La Crosse Technology. 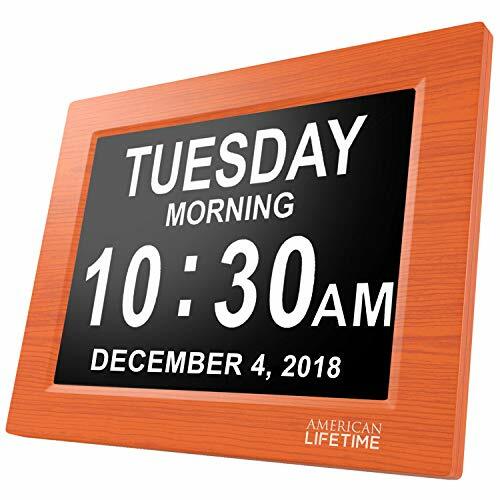 Finding a digital wall clock that’s versatile enough to be used in any part of your home or business might seem impossible, but this one from Live Oak proves it’s not. While it’s simplistic and seamless in its design, it’s a highly functional and easy-to-use wall clock that’s suitable for being set on surfaces or adhered to walls. The digital LED display is easy to read – making it perfect for those with less than perfect vision, and the numbers display brightly both during the day and at night. Therefore, it’s going to be a convenient addition to any part of your home or office. 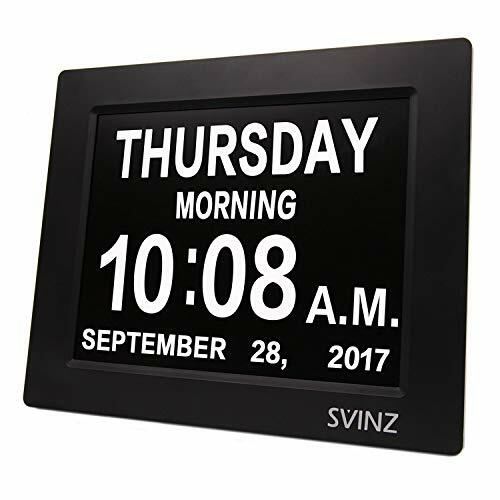 What users will also love about this digital wall clock is its ability to read the day, month, and year as well. As a result, you’re able to rip that paper calendar off the wall and replace it with this clock instead. What’s more, even when the power is out, you will not lose your time settings. This clock is full of surprises and is priced to sell, so consider adding it to your shopping cart today. If name brands matter to you, then you might like to consider purchasing this gorgeous digital wall clock from Casio. From a well-known clock and watch manufacturer, you are set to be impressed by everything this wall clock has to offer. Not only do you benefit from knowing it’s a clock that will last the distance, but it’s also designed to tie in beautifully with both contemporary and classic homes. This is all thanks to its stunning woodgrain pattern and hints of traditional flair coupled with modern conveniences. It shows the digital time with large, bold LCD numbers, and even features the day, month, and year as well. If you’re interested in the internal temperature, this clock can show that as well. This sleek, stunning digital wall clock from Casio may tick all the boxes for your requirements. If you want a digital wall clock but you’re not yet ready to say goodbye to analog altogether, this clock might be the next best thing. Utilizing both traditional time-telling methods and digital advancements, it’s a match made in heaven. It tells the time in analog but does so using the Atomic clock. Therefore, you never have to set it as it will always accurately show the time. It’s self-setting, automatic, accounts for daylight saving and still has a digital LCD screen. It’s all the technological advancements you know and love, but with the analog clock many people still prefer. What’s more, it’s packed full of modern-day features as well. The display has backlighting so you can read the time at night, and it also has a clock and calendar. You will always know what day, month, and year it is, as well as having an option to wake up at a set time as well. Then, if you need a few more minutes of rest, it has a snooze function as well. This digital wall clock is bucking the trend in more ways than one, so it’s well worth your consideration.